But here again, she comes across (to me) as dull, insincere, unfunny and disingenuous. Her "geek cred" according to the piece is trying to update a computer (which, here in the 21st century, is fairly common), changing outfits repeatedly at Comic-Con (which I know she did because she was being paid to for her day job over at G4), and buying a moderately pricey comic book (which I suspect was also a direct result of her being co-host of Attach of the Show). She comes across to me as the high school cheerleader who's prime motivation is to be liked by everyone and is now trying desperately to fit in with a culture of "geekdom" that she got thrust into when she took her job with G4. She was, after all, pursuing a career in acting when she landed the gig and was not following an interest in technology, video games, comics, or anything else along those lines. Munn, however, is NOT the point of this post! No, I only bring her up because she strikes me, in some respects, as endemic of a culture shift. (I'm obviously looking at this from a U.S.-centric point of view, but I can see bits of this elsewhere in the democracies of the world as well.) There seems to be growing recognition that traditionally "geek" interests and ideologies are becoming more and more mainstream. An obvious example would be the growing reliance on comic books as the creative wellspring for Hollywood movies. But there's also a much wider variety of "niche" magazines that would once have been considered too esoteric for anything resembling mainstream promotion taking up plenty of shelf space in grocery stores and libraries. There's also any number of TV shows paying tribute to "geekery" from Big Bang Theory to The Tester. Fifty or a hundred years ago, a person's most likely job prospects revolved around physical labor of some sort -- farming, factory work, etc. We're in a period of flux right now, as we're still moving towards more of an information economy, but those jobs requiring physical labor are increasingly uncommon in favor of jobs centered around more mental tasks. Even the act of designing a poster has been largely removed of the physical labor of cutting and painting and gluing, all of which have been replaced with point-and-click. Now people can bemoan the "loss of spontaneity" or what have you, but the digitization of these processes have made the creation and production processes much less labor intensive, and far more cerebral. I think that part of why we largely grew up in a culture that looked down on geekery is that it was a culture that prized physical over mental prowess. The current school system was designed with that in mind and more attention is given to rote memorization and responding to bells in a Pavlovian manner (both skills prized among factory workers) and less to active learning or creativity. It was a system designed for turning your brain off and letting your body do the work. But as we're moving into a society which relies less and less on that type of mentality, those who did still manage to retain their ability to think despite their anachronistic schooling began wielding more power. They were able to start taking their interests out to the public and finding support. Emotional and financial. You have people who grew up watching Transformers as kids now running Hollywood, and can exercise their interest in a series of big-budget movies about them. 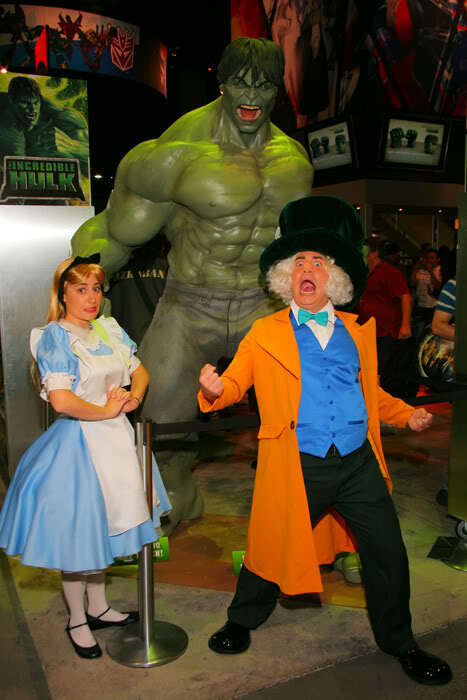 You have Comic-Con International attracting huge numbers of people from ever-widening circles. It's okay to be a geek now because everyone's lives are less reliant on physical labor than they used to be. The physical prowess it took to play football or cheerlead a team are not nearly the necessity that they once were and, as a consequence, those who can't/don't participate (well or at all) have less reason to be ridiculed. But this leaves us in a culture of flux. We're still teaching this antiquated thought process, but nearly everything else around kids tells them that society is not really like that beyond the school yard. Which means that you have people experiencing a form of culture shock once they leave high school, and are left trying to adapt their previously successful coping strategies to a different type of environment. People who try to play off the more cerebral "geek factor" by paying lip service to it, despite not actually having cultivated an interest in anything geeky themselves. To be fair, some people, when encountering for the first time real world geeks with power and influence, learn to appreciate them. I think many of the original Star Trek actors have expressed notions along these lines over the years, and that's one of the messages behind Galaxy Quest. The geek kids are the ones who are relied on to save the day, and the ego-centric, old guard "oh, look, he's torn his shirt off... again" captain recognizes their importance and power. The problem here is that I don't think many people have a solid grasp that this transition is happening (or, in some smaller circles, has happened). I think there's some recognition there, in that iPhones and Iron Man and Lord of the Rings are now more objects of popular culture as opposed to the outsider culture they might've been a decade or two ago, but I don't think most people have much in the way of understanding that shift. I think there are a number of people out there who get that, to be a part of pop culture, they need to cater to "geeks" but I don't think they appreciate why. At least, not yet. That's part of the problem with being flux: it's hard to see what is even changing, much less why. But, in the impending shadow of Comic-Con, I think it's worth noting that "geek prom" is more mainstream than many of its attendees realize. I think Comic-Con has taken on the trade show equivalent of going to Disney World; it's just a cool vacation opportunity where there maybe aren't as many cool rides but plenty of people in costumes, lots of fun, and a number of meals that are more expensive than they should be.